What would you do if you knew you could not fail?" With Action Karate, you will experience a unique approach to self-defense and exercise that benefits the body, satisfies the mind and empowers you to reach and achieve your goals. 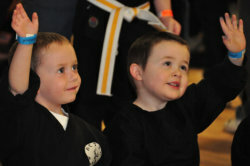 Action Karate Martial Arts School offers an opportunity for Special Needs Children. Contact us to today for information and a trial class. Action Karate Birthday Parties are Kick'n Fun, with 3 styles of parties, in a Kid Friendly and fun atmosphere. Want something extra special, book an appearance by our Demo Team! Build Confidence - Sign-up for your Trial Class Today! 1Karate is more than just self-defense. Students learn a collection of key life skills including Self Control, Discipline, Focus, and Self-Confidence making them a Black Belt in life. 2Action Karate offers class for all age and skill-appropriate classes for students from 4 to adult. 3Action Karate offers specific programs for special needs students as well as private lessons for those looking for customized instruction, Bully Prevention Programs, and fitness classes. 4Incredible birthday parties, Demo Team performances at your location, School programs, and more. This is a story most moms and dads and most children can relate to, it involves a 5 year old little girl getting her first two wheeler. It was a beautiful pink bike that Mom, Dad and child were all proud of. Mom took her out to teach her how to ride for two weekends straight Mom would hold the seat and the handlebars and run alongside the bike and every time it became unsteady she would steady it. After two weekends mom decided the little girl was not ready for a two wheeler. She repeated this process every 6 months until the child was 7 years old thinking to herself maybe bike riding was not her daughters thing. Desperate she stepped back and let the man takeover, he got the little girl setup on the bike got her started and let her go, she crashed and crashed again however on the third try off she went. She thanked the man who explained to her the only way to learn how to ride a bike is by crashing first. You see mom and dad our children learn and grow by crashing that is how they develop the GRIT to not give up by being allowed to crash. Providing Martial Arts instruction, self-defense, and character building for over 15 years. Our team is experienced with children ages 3-18, special needs children can be accommodated, teens, and adults classes are popular. Call now to join Action Karate and speak to Head Instructor Master Judy. Action Karate Main Line is conveniently located on the Main Line in Bryn Mawr/ Haverford, PA If you are in the area stop by and visit our school, meet with an instructor. Action Karate Martial Arts school hosts great birthday parties, summer camps, 1 on 1 martial art instruction, physical fitness, Demo Team performances, and more. At Action Karate we strive to bring innovative programs, anti-bullying seminars, school programs, Boy Scouts, Girl Scouts, and great leadership programs. So call now (267) 625-1209.